Hyaluronic acid (HA) dermal fillers are designed to replace and refill naturally occurring HA in the skin area where it has been lost. HA fillers lift, volumize and restore youthful facial anatomy and are very safe and easy to use. What is the difference between Restylane® and Restylane Lyft® ? The main difference is the viscosity and lifting power of the product. Location and severity of wrinkles and folds will determine which filler is best suited to address and correct the area of concern. Where can you treat with Restylane® and Restylane Lyft® ? The average procedure takes 15-30 min to perform. Dr. Avaliani is a perfectionist and is very meticulous when she is performing injections. She takes great pride and satisfaction in taking her time in order to deliver the results her clients desire. If you are considering lip augmentation procedure, please add extra 30 min for the numbing to take affect to minimize any discomfort. The injections with dermal fillers are virtually pain free as they are designed with smallest needles to allow effective product delivery. The HA filler also already comes premixed with numbing medication, called lidocaine, which greatly minimizes any discomfort that may occur. Will I have any bruising? Dr. Avaliani guaranteed 99% chance of no bruising. She is very proud to be amongst very few physicians, and the only female physician in New York to offer a bruise free guarantee. With the help of Accuvein, Dr. Avaliani is able to directly visualize small, large and medium blood vessel located directly under the skin, therefore decreasing any potential for bruising or bleeding from your average 50/50% chance to less than 1% chance. This allows her client no to worry about the embarrassing bruising and having to make up some stories for friends and coworkers. Guaranteed No bruising results is extremely happy clients. Dr. Avaliani kindly asks her clients to stop taking any potential blood thinning substances like Fish oil, Vitamin E, and over the counter or prescription NSAIDS to minimize any chance of bruising and bleeding. These medications should be stopped 5-7 days in advance. How long is the downtime after my procedure? There is no down time associated with these injections. Clients usually are able to rerun immediately to their regular lives. What happens if I don’t like the results? The best part about using HA dermal fillers is that they are safe, natural and totally reversible. 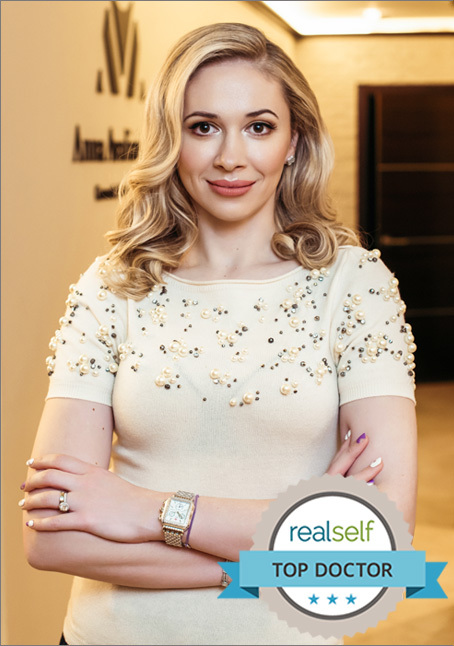 Dr. Avaliani carries an antidote to reverse any evidence of addition of HA fillers. What are the most common side effects after HA filler injections? Pain, swelling, bruising, lumps/bumps have been reported as after HA treatments. These side effects are very mild and usually resolve in less than 5 days. If this causes any discomfort to the client, they are encouraged to take either a Tylenol or Ibuprofen to minimize their discomfort. If the client feels any bump or lump at the site of the injection, they usually resolve in about 7 days. If they persist longer, Dr.Avaliani will inject a dissolving antidote to fix it. How do I know which HA filler I need? Feel free to call or email Dr. Avaliani’s office to schedule your complimentary expert consultation to determine which treatment option will work best for you. The above information is serving as an educational and informative tool, but by no means is a strictly to follow guideline and Dr. Avaliani will discuss any and all other alternatives at the time of your visit.